The plot: John Rambo lives peacefully in a jungle in Thailand. When Christian aid-workers disappear amidst war in Burma, Rambo leads a team of mercenaries to find and save them from Burmese army. The good: Action was pretty cool. The explosions are really loud, body parts are flying around. The final action scene where Rambo gets hold of 20mm gun and kills entire squad of soldiers was awesome: those bullets split people in two. But the best thing about this movie is it is so violent in its graphic depiction of war and casualties of war, it is essentially an anti-war movie. 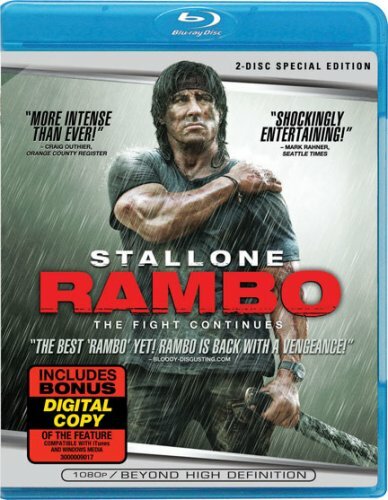 Oh, and also I think Stallone realized that the more Rambo talks, the more pathetic and funny he is. So in this movie Rambo may have said no more then 50 words, which is great. Rambo is not Rocky. He doesn’t need to talk. Also, Stallone looks great at 61 years old – he looks 45. Must be that prescription testosterone – he pumped up to 209 lbs (in Rambo II he weighed only 186 lbs). I also liked Rambo’s cynicism he inherited from Stallone himself: he thinks that people are inherently bad and wars will be perpetual. If people were inherently good we would not need police. The bad: with all the 21st century weaponry available, does Rambo really have to kill with a bow and arrows? Surely, he looks good when he flexes his muscles and aims. The flashbacks using famous footage from original three movies when Rambo decides whether he should help the aid-workers – poorly executed. The aid-workers were so shallowly played – they look like characters from a graphic novel. So were the mercenaries, except maybe Graham McTavish (Cane, Numb3rs, Lara Croft, Rome, King Arthur etc.) who stood out. Rambo must be much harder to play then fast-talking Rocky because Rambo only acts with his muscles and his dark eyes and crooked mouth. But in action genre all the plot keywords are verbs, not adjectives. Overall very entertaining, but violent action movie. Considering the actual situation in Burma I think it’s rather brave and noble to make a movie about it in the age when most antiwar movies are about Iraq, but then an action movie is a money-making enterprise. I have to be honest, I have low expectations as well. I do have to hand it to Stallone though for making the last Rocky and now this. He is getting old, but he just keeps going. I think this is one of those movies that is just cool because it is what it is and not because anyone really expects it to be quality filmmaking. Thanks for the review, I look forward to seeing the movie even if it isn’t the best. 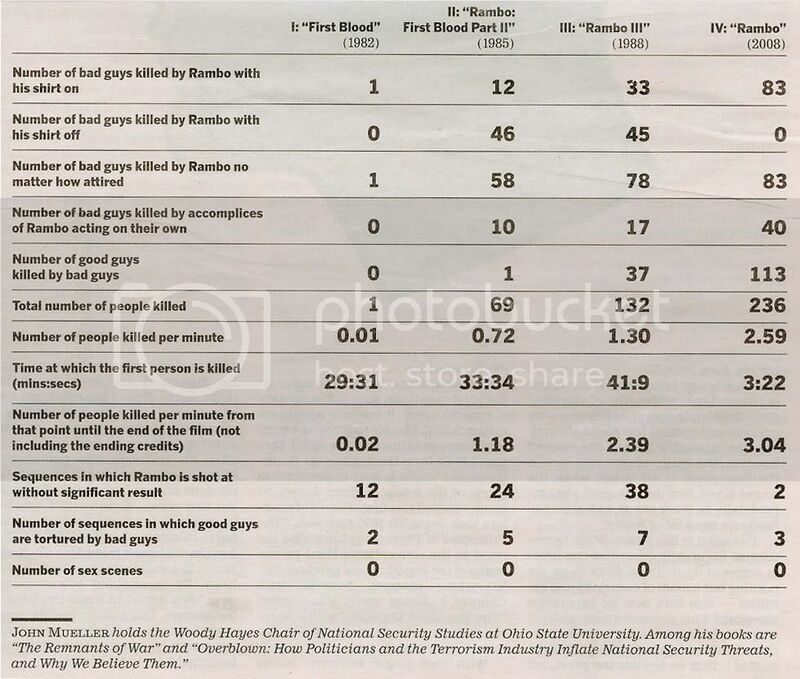 It’s a table of funny statistics about Rambo movies. Take a look.